This hiking trail provides a brisk hike to the impressive rock stacks, David & Goliath. 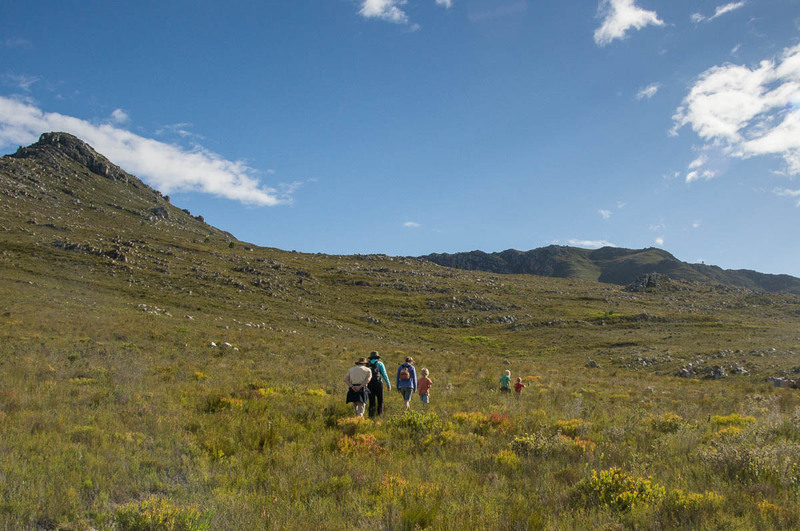 Along the trail are good views along the Klein River Mountains towards Stanford and across the Overberg and Akkedisberg Pass. The path starts just above the car park at Reception. The initial part is easy but there is then a short sharp climb of about 100m up to a rocky outcrop that we call Castle Rocks. 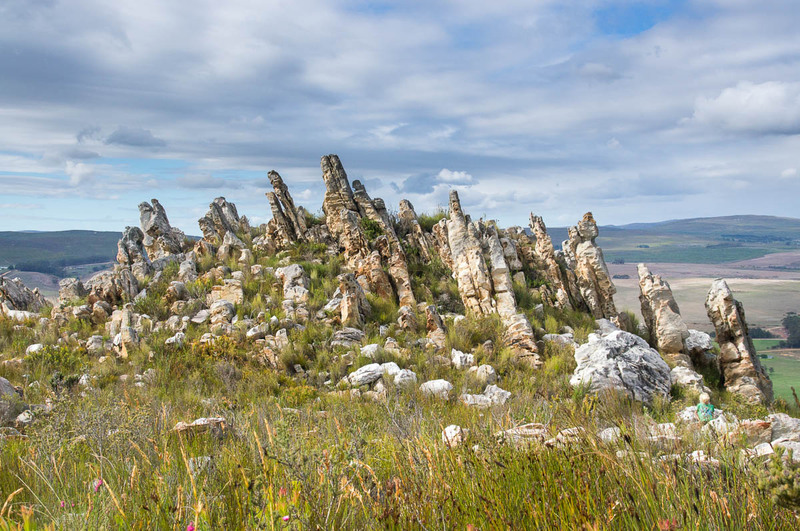 Take a breather at Castle Rocks and look back at the sweeping views across the Overberg towards Gansbaai. From Castle Rocks the path more or less contours around the south-eastern slopes of Phillipskop and gradually the rock stacks come into view. There are also good points to look down into the valley and waterfall. Halfway along there is another brief ascent to get over the crags above Phillipskop Cave (the Cave itself is not visible from this route), but the climb is nothing like the first one. Once past the crags the path descends until it reaches a junction for the path between the waterfall and rock stacks. Continue to the left for another 150m to the base of David rock stack. The names of the rocks stacks have obviously been coined after the well-known Biblical characters. Note the way Goliath towers over the smaller David as they face each other across the valley just as they do in the story. There is even a stream where David picked up his pebbles. The rock stacks are a lovely place for a picnic. 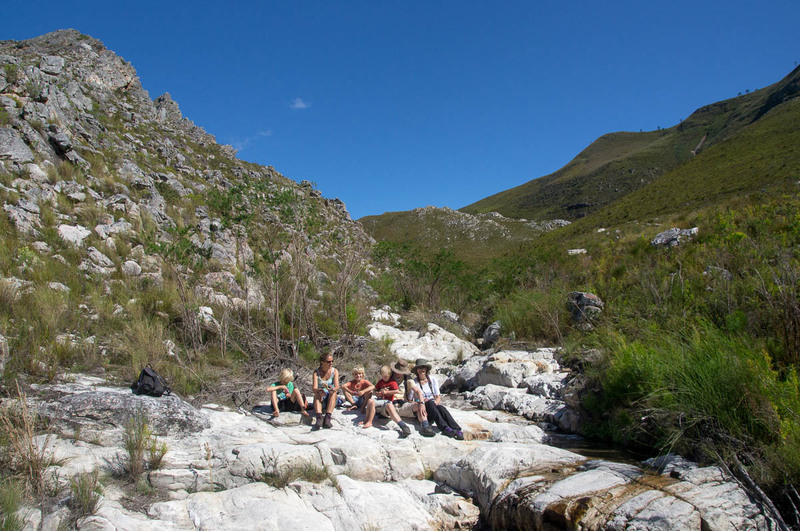 There is water running all year round here and although no pools for swimming, there is plenty of fun for children (but please be careful as the rocks are slippery when wet). From this angle Goliath is almost invisible as it blends into the rock behind showing that it was once all part of the same rock strata. For the braver, it is possible to scramble up David (at your own risk) but please note that under no circumstances should you attempt to climb Goliath even with proper climbing gear. Not only is it not on our land (the boundary is just beyond the stream), it would be damaging to such an impressive rock formation. 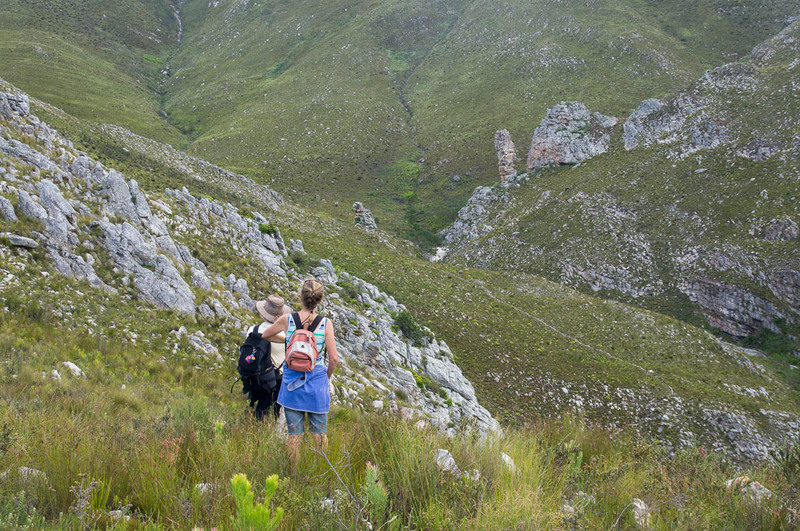 While here it is also worth carrying on a bit around the corner to look up the hidden valley at the back of Phillipskop and admire the crags. Look out for Verreaux’s Eagle (formerly known as Black Eagle) here as it is sometimes seen patrolling the cliffs looking for dassies. If you are feeling energetic, you can continue along this route, heading around the mountain to join up with the Saddle Trail. Alternatively, return via the same route you came or take the slightly longer route by going straight on at the junction and joining the Waterfall Trail back to the car park. We have introduced 6 Geocaches along the Rock Stacks Trail / Waterfall Trail loop. Why not turn your walk into a treasure hunt and try to find these? Rock Stack Hiking Trail route in red. 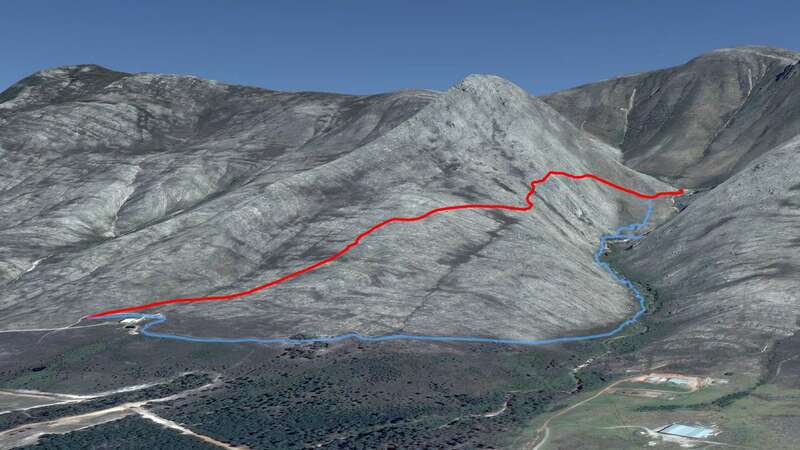 Alternative return route view the Waterfall Hiking Trail shown in blue. 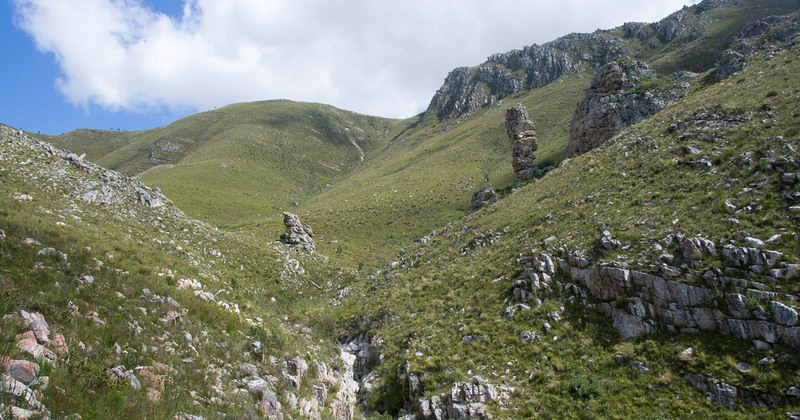 hike, hiking trail, Klein River Mountains, map, Overberg, picnic, rock formation, rock stack, Stanford hiking, walk, waterfall. Bookmark.